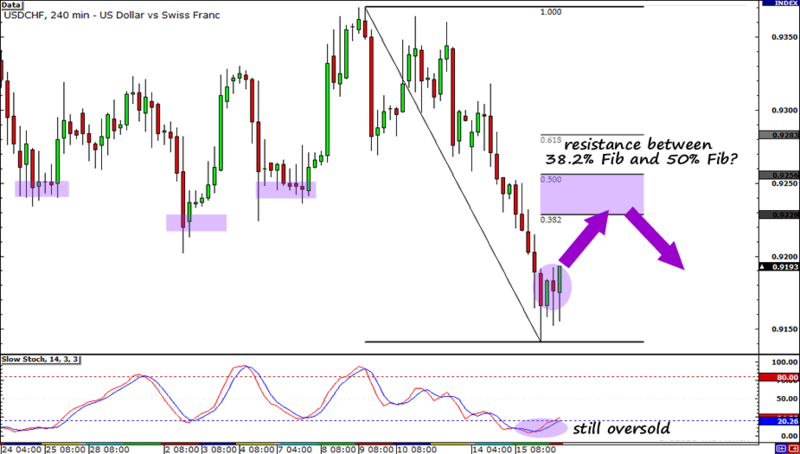 Long CHF Trades in Fashion Again? After touching a new all-time low against the dollar yesterday, who wouldn’t be smitten by the mighty Swissy? But I’m not head over heels yet… As always, I’m going to wait for confirmation! It seems like my best trades were the ones which I had to wait for, so I’m just gonna keep my eye on this one before I pull the trigger. Looking at the 4-hour chart, we see that Stochastic is still in the oversold area which could mean that USD/CHF could be on its way back up again. I drew my Fibonacci retracement levels on the pair and noticed that it previously found support in the area between the 38.2% and 50.0% Fibonacci retracement levels. So my plan is to sell the pair when it retraces some of its downward move. If it stalls around .9250 and if Stochastic indicates that the pair is already overbought, then I’ll probably buy the Swissy. Price action as of late has been driven by risk sentiment due to the situation in Japan. This gave “risk off” trades a chance to shine, with the Japanese yen and the Swiss franc. I don’t see risk aversion going away any time soon, as there is a lot of uncertainty surrounding Japan’s situation. Also, rumors of the Fed dropping its “extended period of low rates” language was disproved yesterday! The Fed’s interest rate announcement simply echoed their statement in January. Dollar-negative? I certainly think so! Anywho, that’s it for now. Stay tuned for my next update. Toodles!